Mystery surrounding choice of firearm for new battle outfit is finally resolved. 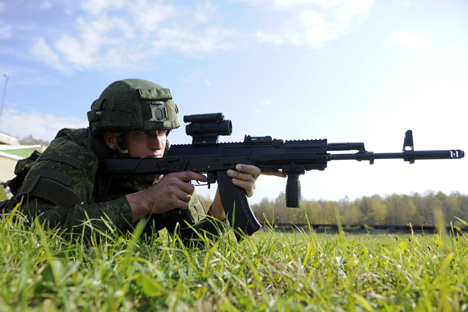 The new Ratnik (“Warrior”) combat gear designed for use by the Russian armed forces will feature the AK-12 assault rifle as part of its standard issue, according to Deputy Defense Minister Yury Borisov. On Jan. 25 Borisov said in an interview with the Russkaya Sluzhba Novostei (“Russian News Service”) radio station that the military had finally given preference to the latest Kalashnikov AK-12 rifle. "It is already decided, this will be an Izhmash AK-12 rifle. The price and quality were attractive to us," said Borisov. Tests of the new combat gear were completed in December 2014, but until it was unclear which rifle would accompany the outfit. The two weapons proposed were the AK-12 and the AEK-971, a rifle manufactured by the V.A. Degtyarev Plant in the town of Kovrov (160 miles from Moscow). The AEK-971 is considered more accurate and more sophisticated due to its beam design, which reduces recoil when shooting. For the AK-12, which features a classical automated venting design, the designers also reduced its recoil and increased its shooting accuracy, while managing to maintain low production costs. According to statements made to the TASS news agency by Oleg Martyanov, a member of the Military-Industrial Commission, as recently as late 2014 it was planned to include both rifles as part of the Ratnik combat outfit.